Yoshiko noticed the hinge door slowly close. The worse kinds of traps usually involve a door closing, separating allies and leaving the trapped to slowly perish from starvation and thirst even if they survived the trap itself. Even if this were not a trap, this would not do, closing up a familiar exit route like that. She lead the dance towards a pose that let her extend her arm out, one where she took out and threw a crowbar towards the door. The crowbar made its mark, jamming the door from fully closing. Even if the gap wasn't big, it would at least provide a point of leverage to open it from the inside or the outside. Yoshiko began to sniff the air and raise her ears, keeping herself alert to the mysteries of this room. She really hoped there was no smell of rotting. A dance. These figures seem to have noble customs to them. Provided this is not a trap, of course. The fact that they could not understand speech and the fact that they aren't petrified corpses but actual carved figures controlled by vines rules out the possibility of becoming one of those as a trap, at least. Yoshiko thought she heard someone call out and fall, but was very much engaged at this... unique situation she found herself in. She shrugged. Surely the rest would be fine. She did warn them of the shadows after all. She took the hand of the figure with ladylike poise. Give the "gentleman" this dance while observing the room. At worse, she'd make a break and regroup. At best, she may make a new friend. Yoshiko screamed from within her mind. She has talked with all sorts of creatures in her life, but this was the first time vine controlled statue was proposing to her. One that could not understand speech. There was only one way to communicate with them. Taking a deep breath, she gently pushed up proposing one's hand to get it to face her in poise more suited for conversation. Then she pointed at him/it, to herself, and then vaguely eastward before making a "man walking" hand sign before an inquisitive shrug. "Before that. You. Me. Able to leave?" - was her intent. Yoshiko was taken back by this display. Is she getting proposed to? By vines controlling statues? But hold on, she was jumping to conclusions. She recalled some mention abou petrification the Big Guy was on about. First she had to establish something, in a sophisticated manner. "*AHEM* Pardon me, good sir, but first may I ask if you understand the common tongue and if so, are you proposing to me? You need only nod or shake the head to each inquiry." Yoshiko took a step back and flicked a bronze coin towards a vine, watching to see what happens before deciding her next move. "Y'even know where e'is love? Th' Demon King o' yers?" Yoshiko prepared a few candles and tied them to the sides of her boots, lighting them and stepping down from the stone, prepping herself to leap back up if the shadow still engulfed her light foosteps. If this worked, she planned to head to the door to the west and take a peek. "By th'way, shadows on th'floor ere b'dangerous lads! S'like pits! 'Ny o'y'mage-y types git some path'o'light spell?" "S'sa deal, Blue Lady! Also don't creep up liddat, love! Nearly lost m'legs ere!" Yoshiko took out a candle, some string and piton. Lighting the candle, she dangled it downward, with intent to see the effect of light on the shadow traps. Yoshiko's tail flared as she high tailed it into the west room, slipping in between the pillars and away from Lady Capilli's view. "Capilli!? I'vner'eard o' it! Nay'seen th'likes o' an ugly things' you! Y'some ugly cat? Snake? What'cha on 'bout, destroyin' stuff?" Yoshiko readied a flask of oil in her free hand, keeping an eye on the shadows for whoever approached. Yoshiko eyed the flickering light from the westward room. "Th' foosteps b'comin' North. I'll check th'west door, see'sf a good spot t'ide... or f'there's goodies~"
She headed off towards the west door, keeping light on her toes, with intent to sneak close and check the door. OOC: Yoshiko will be checking the door with her eyes, nose and ears to see if it looks like a dangerous door and get an idea of what is in it too. As quietly as possible. Yoshiko dashed ahead of and obstructed Ashen's path, her Tabaxi eyes glowing in the dark. "Sides, w'still 'av a deal t'make. A shot a'vengeance, w' payment an' guidance 'round th' place in return. Yay? Nay?" Yoshiko drew a dagger from within her sleeve, just in case something lurked in the darkness. Yoshiko took a brief pause to let the theatriatics of the well-built members of the team sink in before replying to Ashen. "S'you can see'ere, w'av a Triton ready t'wipe th'floor o' any ol' medusa an' a large Bugbear who's git'a clue what'itis." She pointed at Lai Shan. "And th'one o'er there's done assassinations. So w'can 'elp you 'chieve vengeance. All w'ask is f'guidance through th'place. An' per'aps some payment." Yoshiko shoo'd Luis aside as he clearly struggled with the cuffs. "Lemme git'it." She said, as she flicked out a lockpick. OOC: Yoshiko attempts to pick the lock with her thieves tools. Yoshiko stared blankly at Ashen, who is looking quite traumatised. This was bad, she doesn't seem in any shape to elaborate upon what this Medusa was and what she was capable of. No thanks to Aaron breaking the news prematurely. "Don' sweat it'smuch Madam Chanterelle, ere' av a drink an' think n'stead o'... revenge 'gainst th' Medusa th' wronged you." Yoshiko took a bottle of Honeywine and offered it to Ashen before turning towards Aaron. "OI, BIG GUY. TH'BLOODY ELL'SA MEDUSA!?" Yoshiko eyes Ashen a bit before sheathing the dagger concealed in her sleeve discreetly. This woman seems innocent enough. So the cat thought as she listened to the prisoner's ramblings. "So whass'tis Medusa y'speak of? An'tis maze while at it? And guards? Whasshe av'tguard 'ere?" Yoshiko entered just in time to see a naked woman in cuffs plastering herself onto a half-naked Fishman. Immediately, she ran up to him and slapped him in the back. "OI! DON'T BE FLIRTIN WI' TH' PRISONER!" She further observed the surroundings and the prisoner before adding on. "O' dopple. Per'aps succubus. Y'better not 'av freed somethin' nasty." OOC: Yoshiko would like to ready a dagger concealed within her sleeve while getting an Insight read on the prisoner. Yoshiko paused for a bit as she heard the cry for help. She deliberated jumping right in until Sharis went and touched the handprint, disappearing in the blink of an eye. She shrugged and looked around, snatching up the cloth, a bottle of an unknown substance and a deck of tarot cards before slapping her paw onto the handprint. Hearing the sudden noise, Sovereign places a hand on her sword. "Have we been discovered?" she hisses. Yoshiko held up her half-gloved paw. "Not yet, s'only seen'yenter s'all. If w'disappear, s'no reason f'them t'sspect anything! Just'sgotta wait f'..."
Her ears twitched, picking up the sound of small footsteps. OOC: Yoshiko is also going to look around the room for stuff to grab with her nimble paws on the way out if we're leaving. "Once everyone gets here, you all go ahead of me. I'll stay behind and conceal this room for as long as I can before I have to leave. In the time that I'll be standing by, those Queensmen will not even know there is a room here." "Y'might wanna check'th ladder's put away too. Wouldn't want t'invite more s'spicion. W'recommen' we still stash th'painting 'fter w'disappear too, f'safety's sake." She counted the people as they arrived. "Edge elf... Twinklemutt... Hoods... where's th' grumplizard?" Yoshiko saw Lai Shan arrive and handed her the glass of wine she was saving. "Pipe down y'all. Whassat Truman? Th'recognised Sovereign thu 'th front door? S'only means th'seen one of us enter a library. All w'gotta do's 'ide all evidence and disappear b'fore showin' em th'room!" Yoshiko stared at the painting and downed her glass of wine in a full gulp. "M'gods, tis' vibratin. 'Seither th'real deal or some artist's git' an 'eird fetish." Yoshiko raised an OK sign at Lai Shan before she left as she continued savoring her glass of wine. She filled the other glass with a refill, prepping it for Lai Shan lest Sharis down the entire cache before she could return. "By th'way, y'all seen'th edgy warlock'round? " Yoshiko addressed the Bugbear in the room in a nonchalant fashion. "Ohhey Aaron, dn't see y'there.Th'went off t'find you, actually." 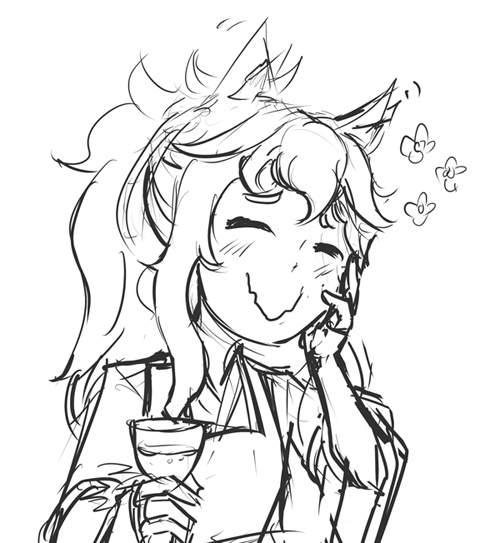 She took a sip of Honeywine... and clutched her cheek with her free hand, her face curled up in an expression of pleasure. This wine would do very fine. Yoshiko held her cup up. "Eeeeeeeh ah'll take a whiff. If'tastes like piss', I'll take y'on th'offer~"
Yoshiko readied her glass for the wine as she observed the painting once more as light gleamed at an angle towards it. It still looks crappy in a dim lighting. Yoshiko stuck her tongue out at the hooded man called Seth. "M'tongue'snot takin well t'tastes not salty nor sweet, boy. Most booze taste like piss water." She flicked her hair and placed a finger on her cheek, glancing back at Seth with a hint of venom. "Sides, s'not like i'vta enforce masculine image like some chaps, eh prettyboy~?" Yoshiko shrugged and took a glass too. "Fineeeee~ But th'Honeywine better be sweet as th'name implies." She stuck her tongue out and muttered something repulsive about a beverage called the Sunshine Cloud.